Specialty Tea: Celestial Seasonings, Uncle Lee's, Numi Tea, Yogi Tea! • Licorice Root: As early as the third century B.C., herbalists valued the beneficial properties Licorice Root (Glycyrrhiza glabra), had to offer, traditionally using the herb to support upper respiratory health. Alvita Licorice Root Tea is made with quality, organic Licorice Root, and releases the pleasantly sweet flavor and aroma most people associate with Black Licorice. 24 bags. BUY NOW! • Specialty Tea Power Energy & Stamina: A complex blend of herbs, barks and roots make up this delightful, enriching tea with antioxidant and adaptogenic properties. Brings in the strength of the earth, with roots, bark and traditional herbs that reinforce the body.16 ct. BUY NOW! Ingredients: Nettle leaf, Sumac Berries, Mullein leaf, Hawthorn leaf and flower, Sassafrass Root, Ginger root, Ginseng root, Stevia leaf. • Specialty Tea Joy, Love & Passion: Joy, Love & Passion Tea is made with traditional herbs for the heart, Roses, Lemon Balm, Passionflower, Hibiscus Flower and Borage are blended in this refreshingly complex, floral blend. 16 ct. BUY NOW!. Ingredients: Lemon Balm leaf, Borage leaf and flower, Passion flower leaf and flower, Damiana leaf, Hibiscus flowers, Rose petals, Stevia leaf, Cinnamon Bark, Ginger root. Power Energy & Stamina,16 ct. TEA: Specialty Tea, 16 ct.
• SPORTea: SporTea is blended with all-natural rare teas, herbs, and spices to help fight fatigue, boosts energy and builds stamina. SporTea is made with Ginger to help boost circulation; Potassium helps relieve stress by relaxing tense muscles. There is no aftertaste so your thirst is really quenched. Contains full daily dose of Vitamin C to fight colds, plus trace minerals and electrolytes to replenish bodily systems. Only traces of caffeine which in this quantity will positively invigorate the nerve endings and will not overload you. Added the world`s finest Siberian Ginseng - a systems adaptogen that rejuvenates you and helps your body operate more productively. So, physically, you feel restored, more energized and more mentally alert throughout the day. • SPORTea: 20 tea bags. BUY NOW! • SPORTea: 7 quart-size tea bags. BUY NOW! Ingredients: A Blend of Black and Green Teas, Siberian Eleuthero Root (Scientific Name: Eleutherococcus Senticosus), Ginger, Mate, Vitamin C (Ascorbic Acid), Natural Flavorings. • Savory Tea Beet Cabbage: A brilliant crimson tone greets you into pleasant scents of Clove. This smooth buttery blend is rooted with Beets and Cabbage and gracefully spiced with Mustard seed and Coriander. The finish is highlighted by sweet notes of Apple and decaf Black Tea. 12 bags. BUY NOW! • Savory Tea Broccoli Cilantro: As pungent scents entice you into this plentiful garden, the energetic flavors of Broccoli, Celery leaves and Cilantro acquire your palate. Turmeric and decaf Green Tea provide a peppery flavor. Come home and unwind to a cup of Broccoli Cilantro's sweet long-lasting taste. 12 bags. BUY NOW! • Savory Tea Carrot Curry: Be delighted to the heart of India with the rich exotic flavors of Curry, Turmeric and Ginger. Caressed by sweet Carrots and bright Cilantro, the earthy, vegetal and piquant notes are remarkably interlaced together into this full-bodied blend. 12 bags. BUY NOW! • Savory Tea Fennel Spice: Enticed by the calming scents of freshly cut Fennel, this invigorating blend will transport you to the captivating European countryside. The energetic flavors of sweet Licorice cover the earthy fullness of Celery root while slivers of Orange peel and decaf Green Tea gratify the palate. 12 bags. BUY NOW! • Savory Tea Garden Sampler: An abundance of vegetables herbs and spices anticipate you, ready to nurture and comfort you from the inside. This Garden Sampler holds a variety of the tasty and nourishing Savory Teas. The box contains two bags of each of the new flavors: Tomato Mint, Carrot Curry, Fennel Spice, Spinach Chive, Beet Cabbage and Broccoli Cilantro. 12 bags. BUY NOW! • Savory Tea Spinach Chive: Levels of steamed Spinach greens deliver the mouthwatering richness of this savory beverage. The Citrus notes of Numi's Dry Desert Lime tickle the roof of your mouth as Coriander tantalizes your taste buds. Dill, Chive and decaf Green Tea are the ideal finish to this seasoned, yet intricate blend. 12 bags. BUY NOW! • Savory Tea Tomato Mint: This brilliant Mediterranean blend is indicative of the sweet savory scent of stuffed Grape leaves (dolmas). The combination of ripe Tomatoes, Mint leaves, decaf Black Tea, a touch of Cinnamon and Lemon peel makes for a zesty, mouthwatering cup. 12 bags. BUY NOW! Indulgent Tea is a collection of chocolate teas that revel in the blending tea and cacao. Indulgent Tea is the ideal union for tea and chocolate lovers looking for a guilt-free treat. Enjoy these delightful tea blends any time of day with milk or honey, or simply on their own. They also make a great latte. Indulge in their delightfully complex, yet subtle layers of richness. • Indulgent Tea Chocolate Spice: Melt-in-your-mouth Chocolate Spice Tea is made with rich Cacao with a host of colorful Chai Spices. Ginger and Cloves are warming, Cardamom adds kick and Cinnamon rounds off this exotic treat. 12 bags. BUY NOW! • Indulgent Tea Chocolate Mint: Chocolate Mint Tea is made with Moroccan Mint, Cacao and Orange Peel for a sweet balance. The spearminty flavor adds a bit of spice and Orange Peel adds a hint of citrus. 12 bags. BUY NOW! • Indulgent Tea Chocolate Earl Grey: Delightful Aged Earl Grey Tea combines seamlessly with Cacao and real Vanilla Beans. Sweet Bergamot Orange notes blend with creamy Vanilla and Chocolate for a mesmerizing delicacy. 12 bags. BUY NOW! • Indulgent Tea Chocolate Rooibos: Chocolate Rooibos Tea is made with smooth South African Rooibos, creamy real Vanilla Beans, sweet Honeybush and rich Cacao. This stimulating delicacy is a delightful, calming beverage you can melt into. 12 bags. BUY NOW! • Specialty Tea White Rose: Captivating White Rose Tea blends the smoothness of delicate, organic White Tea with whole organic Rose Buds. This sweet and floral aroma is as tantalizing as it is healthy. With every sip, White tea imparts a silken smoothness. White Tea is the tender bud of the tea plant making it wonderfully delicate and healthy. High in antioxidants and vitamin C, uplifting White Rose Tea blend will be the beginning of a long-lasting love affair. 16 bags. BUY NOW! • Specialty Tea Mini Sampler Petite Bouquet: Petite Bouquet features four delicate hand sewn Flowering Tea assortments for your pleasure. Experience the magic of blossoming tea leaves and sip in the grand tastes from sweet and subtle to rich and bold. Petite Bouquet offers you a alluring sample of Numi's Flowering Teas. Invigorate your senses with the uplifting flavor of these Leaves of Art. Petite Bouquet Flowering Teas may be steeped up to 3 times for 12 pots of tea. 4 Blossom ct. BUY NOW! • Candy Cane Lane: This delicious holiday blend features naturally decaffeinated Green Tea and made with seasonal flavors like cool Peppermint, creamy Vanilla and Cinnamon. Candy Cane Lane® will become a cheerful and healthy tradition at your festivities! 20 bags. BUY NOW! • Gingerbread Spice: This custom-made blend is a medley of Ginger, Cinnamon and other traditional ingredients that offers the spicy aroma of freshly made gingerbread. Because it's naturally caffeine free, you can pamper in this clearly happy tea any time! 20 bags. ORDER TODAY! • Nutcracker Sweet: Nutcracker Sweet is an exciting simple blend of fine Black Teas made more cheerful with creamy, nutty Vanilla and a hint of Cinnamon. A decadent-yet-healthy delicacy, this wonderful tea captures the magic of the world's favorite ballet, The Nutcracker, bringing holiday merriment for more than 100 years. 20 bags. ORDER TODAY! • Sugar Cookie Sleigh Ride: This joyful holiday blend will warm your heart with the appealing fragrance and wonderfully simple taste of freshly baked sugar cookies. Sugar Cookie Sleigh Ride has no sweeteners or added sugars, providing a guilt-free way to drink freely in the festive season. 20 bags. BUY NOW! • Sugar Plum Spice: A rich herbal blend made with juicy purple Plums and fragrant spices like Ginger and Cardamom with tart Hibiscus, floral Chamomile and a hint of sweetness. Every sip transports to the Land of the Sweets in Tchaikovsky's The Nutcracker, where the beautiful Sugar Plum Fairy directs the festive flavors of sensory delights. 20 bags. BUY NOW! • Lemon Zinger: Lemon Zinger tea is the classic lemonade stand-style drink is made with real Lemons and lively Guatemalan Lemongrass. Blended Lemons with Hibiscus, whose tangy taste and ruby-red color are the signature of a Zinger, to make a cheerful tea that's equally nourishing under the sun and the moon. 20 bags. ORDER TODAY! • Roastaroma: Roastaroma® is a flavorful, caffeine-free substitute to coffee has been a trusted favorite for more than 30 years. Made with hearty flavors of roasted Chicory and Barley, Chocolate from roasted Carob, and a hint of Cinnamon and Allspice. Roastaroma® is energetic enough to give you a lift in the morning and delicious enough to enjoy all day long. 20 bags. ORDER TODAY! 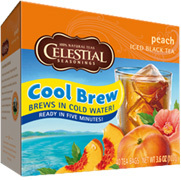 • Cool Brew Iced Tea Peach: This delicious blend of two summertime favorites is the ideal thirst quencher on those hot days. A spirited blend of juicy, orchard-fresh Peaches and robust iced Black Tea helps relieve from dehydration. 40 bags. BUY NOW! 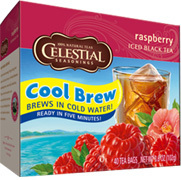 • Cool Brew Iced Tea Raspberry: The cool flavor of robust iced Black Tea is energizing. Added tart and tangy Raspberries to create a luscious Cool Brew that's revitalizing. 40 bags. BUY NOW! 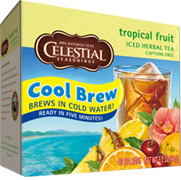 • Cool Brew Iced Tea Tropical Fruit: The luxuriant, smooth tastes of two caffeine-free African herbs: Honeybush and Rooibos are complemented by the summertime medley of Pineapples, Bananas, and other refreshing tropical flavors. Stay cool during the sultry days of summer with this refreshing, caffeine-free blend. 40 bags. BUY NOW! • Rooibos Tea Madagascar Vanilla: Rooibos is a smooth and calming herb whose slightly nutty flavor provides hints of Cherry and Toffee. Madagascar Vanilla red tea, Rooibos is perfectly complemented by the rich flavor of Vanilla for a uplifting and nourishing tea experience. 20 bags. BUY NOW! • Rooibos Tea Moroccan Pomergranate: Moroccan Pomegranate combines Rooibos with scarlet-red Pomegranate flavor and tart Hibiscus to create a delightfully fruity caffeine-free blend that you'll relish both iced and hot. This Red Tea blend provides a fruitful way to enjoy the full range of rooibos tea benefits. 20 bags. BUY NOW! • Rooibos Tea Safari Spice: Safari Spice Red Tea blends authentic Rooibos with the flavor of the exclusive sweet piquant Pepper, tangy Hibiscus and exotic spices like Ginger and Cinnamon to create a balanced cup with a satisfying, flavorful spiciness. 20 bags. BUY NOW! • Seasonal Tea Breathe Easy: Breathe Easy tea is an original formula to help support respiratory health. A unique blend that is comforting and engages the senses. Combined with Eucalyptus, Fennel and Licorice, Bi Yan Pian extract, a traditional Chinese formula of 12 different herbs. A sweet-smelling and aromatic blend that calms with its warm and spicy taste. 16 Tea Bags. ORDER TODAY! • Seasonal Tea Seasonal Sampler: Seasonal tea sampler includes 4 tea bags each of clinically tested Throat Coat®, clinically tested Organic Echinacea Plus®, Breathe Easy® & Gypsy Cold Care®. 16 Tea Bags. ORDER TODAY! • Seasonal Tea Gypsy Cold Care: Gypsy Cold Care® tea helps warm your spirit, brings comfort on cold winter nights. Made with Elder, Yarrow and Peppermint that helps nurture and comfort your weary body by its warming properties. Sip slowly and enjoy the aroma of the stimulating, minty steam that rises off this tea. Aromatic, minty, slightly sweet and spicy. 16 Tea Bags. ORDER TODAY! • Seasonal Tea Throat Coat: Throat Coat Tea is made with Slippery Elm or Ulmus rubra (lovely reddish inner bark) is a beautiful, native North American elm tree. Blended with Licorice and Marshmallow Root to help transport your voice to the spa—because all is needed a little comfort. Sweet and earthy, silky, with a distinct licorice taste. 16 Tea Bags. ORDER TODAY! • Seasonal Tea Throat Coat Lemon Echinacea: Throat Coat Lemon Echinacea Tea supports throat health and gives your immune system a boost! Blended with calming herbs is like taking your voice on a vacation and provides a smooth and silky feeling. Made with Licorice Root for its sweet, balancing qualities and Marshmallow for its well-known soothing properties. Combined with the added immune-stimulating properties of Echinacea you'll be singing it loud and proud in no time. Sweet, viscous and lemony, with Echinacea's distinctive tongue-tingle. 16 Tea Bags. ORDER TODAY! • Seasonal Tea Echinacea Plus: Echinacea Plus® tea is made with this pleasant-tasting herbal blend helps support a healthy immune system response. Mildly minty, with a twist of citrus. Relax and notice Echinacea's distinct tongue-tingling effect, a sign of very high quality. 16 Tea Bags. ORDER TODAY! • Seasonal Tea Echinacea Plus Elderberry: Echinacea Plus® Elderberry is stimulating and supportive. Echinacea is known for its ability to promote a healthy immune system response. Sweet and berry-like, with mild bitter notes. 16 Tea Bags. ORDER TODAY! • Specialty Tea Tahitian Vanilla Hazelnut: Tahitian Vanilla Hazelnut provides a delightful aroma of this enchantingly delicious blend. This distinctive and opulent tea is made with natural Vanilla and Hazelnut flavors with a hint of velvety Carob for vigor and enjoyment. Added classic Ayurvedic spice blend of Cinnamon, Cardamom, Ginger and Clove to naturally warm and cleanse the body. Relish a cup of this alluring and caffeine-free tea for a pleasant treat any time during the day. 16 bags. ORDER TODAY! • Specialty Tea Mayan Cocoa Spice: Mayan Cocoa Spice is made with prized cocoa beans and spices to create a tantalizingly rich and enlivening beverage. Combines with organic Cocoa Shells, which supply antioxidants, and Ayurvedic stimulating spices of organic Cardamom, Clove and Cinnamon Bark. Savor this rich tasting and revitalizing blend any time of day for a enchanting treat. 16 bags. ORDER TODAY! • Specialty Tea Chai Tea Black: Rich, full-bodied Organic Assam Black Tea is an original, stimulating chai, and added a blend of the classic spices of Cinnamon, Cardamom and Ginger, traditionally used for their warming and cleansing properties. Savor the refined flavor of the appealing Chai Black. Enjoy it plain, or for a more traditional brew add milk or milk substitute and your favorite sweetener. 16 bags. ORDER TODAY! • Specialty Tea Chai Tea Green: Chai Green is distinctively blended with organic China Chun Mee Green Tea supplies antioxidants to help support the body's defenses against damaging free radicals. Made with energetic Cinnamon and Ginger for true chai flavor and light notes of Cardamom offers the aromatic flavor of this appealing tea. When you have the mood for something a little different, enjoy the beautiful experience of Yogi's Chai Green. 16 bags. ORDER TODAY! • Tulsi Tea Green: A well-balanced blend of Tulsi and Green Tea is simply highlighted with an fragrant Lemon flavor lift from Tulsi. This delightful flavor combination offers a natural energy boost with half the caffeine! 18 Tea Bags. ORDER TODAY! • Tulsi Tea Jasmine: A floral blend of Tulsi, Chamomile, and Jasmine, highlighted with sweet notes of Anise. Ideal for romantic moments or reflective quietness that fills your senses with peace and harmony. 18 Tea Bags. ORDER TODAY! • Tulsi Tea Jasmine Green: A brilliant combination of three different Tulsi leaves, Rama, Krishna and Vana is combined with the enchanting Jasmine herb, Green tea, Ginger, and Chamomile. This calming blend delivers an aromatic natural energy boost with half the caffeine. 18 Tea Bags. ORDER TODAY! • Tulsi Tea Licorice Spice: Licorice, known as the great harmonizer in Chinese medicine, brings its calming sweet character to India's legendary sacred herb, Tulsi, creating a comforting tea with flavor notes of spicy Cinnamon, Ginger, and Lemon. 18 Tea Bags. ORDER TODAY! • Tulsi Tea Red Chai Masala: Naturally caffeine-free Red Chai Masala is blended with Rooibos, an aromatic tea leaf from South Africa, stress-relieving Tulsi and classic Chai Tea spices like Cinnamon, Ginger, Cardamom, Roasted chicory, and Nutmeg. Rooibos' flavor is strong, and expertly balanced with other ingredients to a completely unique-and incredibly healthy. A few sips of this splendid, delightful tea and you'll fall in love with its distinct sweet-yet-spicy, full-bodied, nutty taste. 18 Tea Bags. ORDER TODAY! • Tulsi Tea Cinnamon Rose: Cinnamon Rose Tea is made with a delicate blend of Rama, Krishna and Vana Tulsi, Cinnamon, Cardamom, Rose Petals and Cassia to provide a balanced, healing combination which stimulates the senses. With a lovely touch of sweetness, this beverage will warm you. 18 Tea Bags. ORDER TODAY! TEA: Tulsi Tea Specialty, 18 ct.
• Imperial Organic Chai Tea Orange Ginger Rooibos: Imperial Organic's Orange Ginger Rooibos Chai is a wonderful experience with spices from around the world. A distinctive recipe originating from India, combined exotic Chai spices with Orange and Ginger for a Gingerbread flavor. Made with Red Tea (Rooibos) to provide an organic and naturally caffeine-free blend. 18 ct. BUY NOW! • Imperial Organic Chai Tea Cinnamon Rooibos: With spices from around the world, Imperial Organic's Cinnamon Rooibos Chai is a delightful experience. A distinct Cinnamon-rich recipe originating from India, blended with exotic spices and Rooibos to produce an organic and naturally caffeine-free tea. The spicy blends in chai teas are ideal hot or cold. 18 ct. BUY NOW! • Imperial Organic Chai Tea Vanilla Rooibos: Vanilla Rooibos Chai is made with spices from around the world for a pleasant experience. A unique recipe originating from India, combined exotic spices with aromatic Vanilla. Combined Red Tea (Rooibos) to create an organic and naturally caffeine-free blend. 18 ct. BUY NOW! • Imperial Organic Chai Tea Lemon: With spices from around the world, Imperial Organic's Green Tea with Lemon Chai is a enjoyable experience. An exclusive recipe originating from India, combined with exotic Chai spices, tangy Lemon, and organic Green Tea. Organic and delicious, this tea is one-of-a-kind, and an all-time preferred Chai Tea by enthusiasts. 18 ct. BUY NOW! • Organic Chai Tea Orange Ginger: Orange Ginger Chai (pronounced "cheye") is an exclusive combination of traditional East Indian spices and "rooibos," an herb that tastes like black tea, has anti-oxidant properties like Green Tea and is naturally caffeine free! Relish Orange Ginger Chai with its warm, revitalizing blend of special spices and hint of Orange peel. 18 ct. BUY NOW! TEA: Imperial Organic Chai Tea, 18 ct. Traditionally, Chai is a brewed beverage blending flavor rich spices and Black Tea with milk and a sweetener. Chai is naturally sweet so you can avoid the extra calories of sugar or honey. Made with 100% organic ingredients. • Organic Chai Tea Peppermint: Peppermint Chai is made with traditional East Indian spices and peppermint, one of the world's most widely appreciated herbs. Savor this cooling Peppermint Chai. It is caffeine free and naturally sweet so you can keep away from the extra calories of sugar. 18 ct. BUY NOW! • Organic Chai Tea Cinnamon: Cinnamon Chai is a exclusive combination of traditional East Indian spices and "rooibos", an herb that tastes like black tea, has anti-oxidant properties similar to Green Tea and is naturally caffeine free. 18 ct. BUY NOW! TEA: Organic Chai Tea, 18 ct.
For hundreds of years bamboo leaves have been used in both Chinese and Ayurvedic medicinal teas. Bamboo leaves have some of the highest concentrations of vegetable Silica for maintaining hair and nail health. Bamboo leaf tea also contains 1 gram of soluble fiber per 8 oz. cup and is a good source of micronutrients and antioxidants. The natural flavor of bamboo tea is sweet, complex and mildly grassy for a fresh, light tea! Our Bamboo Teas are certified organic and caffeine-free, unlike many other commercially harvested Bamboos. Organic means healthier for you, without all the modern toxic chemicals in the production process. • Organic Bamboo Tea Exotic Fruit: Organic Bamboo Tea Exotic Fruit is blended with exotic fruit flavors to make you feel like being in a paradise island while you enjoy a cup of Bamboo Tea. The grand combination of aromatic exotic fruits and bamboo leaves is simply a perfect complement. 18 ct. BUY NOW! • Organic Bamboo Tea Hibiscus: Organic Bamboo Tea Hibiscus is blended with the mysterious flavor of the Hibiscus Flower which provides an enchanting fragrance to the original flavor of Bamboo Teas. You will simply love it and cannot find the same anywhere else! 18 ct. BUY NOW! • Organic Bamboo Tea Lemon Ginger: Organic Bamboo Tea Lemon Ginger is blended with the tangy Lemon and the powerful ginseng. This flavor combination is ideal for most people who enjoy Lemon flavored tea and also want an extra health benefit of Ginseng. 18 ct. BUY NOW! • Organic Bamboo Tea Mint: Organic Bamboo Tea Mint is blended with a slight hint of Mint, otherwise known as Menthol, to provide you that cooling sensation taste while you enjoy the bamboo tea. Organic Bamboo Tea Mint flavor is ideal for the hot days or for all mint lovers. 18 ct. BUY NOW! • Organic Bamboo Tea Original: Organic Bamboo Tea Original contains only the original flavor of bamboo leaves. You simply savor the delightful and natural essence that a bamboo leaf offers you. 18 ct. BUY NOW! TEA: Organic Bamboo Tea, 18 ct.
• Specialty Tea Original Chai: Chai is made of Gingery warmth, Cinnamon glow, Cardamom vigor, and a Black Tea boost speckled with Licorice. Enjoy a royal cup of tea! 20 Tea Sachets. BUY NOW! • Specialty Tea Vanilla Chai: Vanilla Chai is made with fairly-traded sweet organic Vanilla tingling with Cinnamon and Ginger, and gentle with Cardamom, Fennel and Licorice. There's no caffeine here, just six herbs brimming with vitality. So heat some water and off you go - an aromatic sensation in a cup. 20 Tea Sachets. BUY NOW! Stackable Sip Sampler Tin: A delicious, wonderful introduction to the flavor and health of Zhena's Gypsy Tea. Sip sampler contains four individual recyclable air tight tins, each tin filled with four single cup servings. Small, pocket-sized tins so you can enjoy a delicious cup of tea anywhere at anytime. • Sampler Tea Black: Black Tea tin stackable sampler. Each sampler contains four embossed recyclable air tight tins containing four sachets of 100% certified fair trade and organic tea for 16 total sachets. ORDER NOW! -- Peach Ginger: Bio-Dynamic, Ceylon & Indian Black tea made with organic ginger root and organic peach flavor. -- Coconut Chai: Indian black tea, organic cinnamon, ginger, cardamom pods, whole cloves, orange peels, nutmeg, org. black pepper, organic cinnamon essential oil and organic coconut flavor. Raspberries and organic raspberry flavor. -- Gypsy Rose: Chinese Black Tea, Red and Pink Rose Petals and organic natural flavors. • Sampler Tea Chai: Chai Tea tin stackable sampler. Each sampler contains four embossed recyclable air tight tins containing four sachets of 100% certified fair trade and organic tea for 16 total sachets. ORDER NOW! -- Chocolate Chai: Caffeine-free organic Rooibos, Mediterranean Carob, Ginger, Cinnamon bark. Chicory and Licorice root. -- Coconut Chai: Indian Black Tea, organic Cinnamon, Ginger, Cardamom pods, whole Cloves, Orange peels, Nutmeg, org. Black Pepper, organic Cinnamon essential oil, organic Coconut flavor. -- Caramel Chai (Red): Organic, Fair Trade Certified™ Rooibos, Cinnamon, Ginger Root, Licorice Root, Natural Flavoring, Cloves, Cardamom, Nutmeg, Black Pepper, Organic Vanilla Bean. -- Hazelnut Chai (Red): Organic, Fair Trade Certified™ Rooibos, Cinnamon, Ginger Root, Licorice Root, Natural Flavoring, Cloves, Cardamom, Nutmeg, Black Pepper, Vanilla Bean. • Sampler Tea Variety: Chai Tea tin stackable sampler. Each sampler contains four embossed recyclable air tight tins containing four sachets of 100% certified fair trade and organic tea for 16 total sachets. ORDER NOW! -- Rasberry Earl: Bio-Dynamic, Ceylon & Indian Black tea, with Italian Bergamot, Freeze-Dried Raspberries and organic raspberry flavor. -- Egyptian Mint: Organic, bio-dynamically grown Ceylon Green tea, organic Egyptian peppermint & organic South American Stevia leaf. -- Ambrosia Plum: Green and white Indian tea, organic strawberry leaf, Bulgarian rose petals, organic Stevia leaf*, natural plum extract. -- Italian Chamomile: Fair trade, Egyptian Chamomile, organic fennel, organic hibiscus, organic lemon peel, organic rosebuds, organic essential oil of lemon. • Specialty Tea To Your Health: To Your Health Tea is made with nurturing and immune-tonic herbs like Nettle, Echinacea and Elder Flower in this invigorating tea designed to keep your defenses functioning on an optimal level all year round. Classic herbal flavors is blended with Rose Hips and Cloves, in a cup to raise To Your Health. 16 ct. BUY NOW! Ingredients: Certified Organic Nettles, Echinacea, Dandelion leaves, Red Clover blossoms, Burdock root, Elderflower, Rose hips, Orange peel, Cloves. 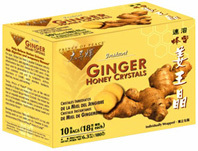 TEA: Specialty Tea: To Your Health, 16 ct.
• Instant Ginger Honey Crystals: brings you all the natural benefits of ginger and honey. For ages, Ginger has been used for generations in Asia for temporary relief from common cold and flu symptoms, asthma, shortness of breath, water retention, backache, diarrhea, nausea, and vomiting. Each bag contains concentrated extract from 12 grams of raw ginger, which is the base for the appealing aroma and exquisite smooth taste. Instant soluble, convenient, and has no artificial additives. You'll love this natural sweet and spicy flavor! 6.3 oz. / 10 Bags Individually Wrapped. ORDER TODAY! • Instant Ginger Honey Crystals with Lemon: Lemon Ginger Honey Crystal is a exclusive blend from Prince of Peace that brings you all the natural benefits of ginger and honey. Each sachet contains concentrated extract of raw Ginger, which is the base for the alluring aroma and delicately smooth taste. The natural sweet and spicy flavor makes this a year round favorite drink. Served hot, it will warm you instantly from the inside. 6.3 oz. / 10 Sachets. ORDER TODAY!